If you lived in Sutton in the 1840s you might feel glad that the town was not disfigured by factory chimneys and that it was still a charming rural backwater. On the other hand, you might envy the Birmingham folk who benefitted from the modern conveniences of life which the industrial revolution brought - in particular, railway travel and gas lighting. By 1850 Sutton was seriously behind the times, still relying on dim oil lamps for its street lighting while all the local towns were brightly lit by gas. 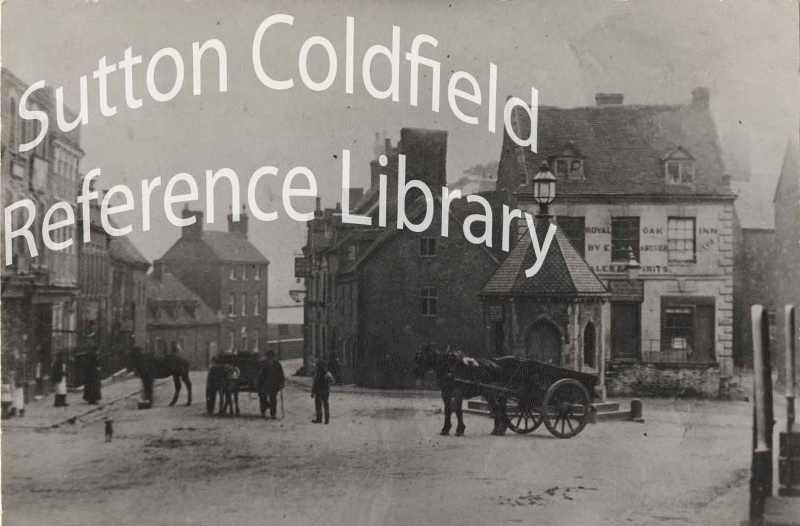 Then enterprising local people set up the Sutton Coldfield Gas Light and Coke Company, registered on December 30th 1853; Sutton Library has one of the original share certificates. A site for the gasworks was agreed, on the corner of Riland Road and Coleshill Street, and by 1856 the streets in the centre of Sutton were bathed in gaslight. The gas company supplied a limited area in the town centre, partly because of the expense of laying gas mains to outlying areas and partly because of limited capacity. All the coal for the gasworks came by horse and cart from the coalmines at Brownhills until the Sutton Branch Railway line opened in 1862, so the gas was quite expensive. As more and more houses were connected to the mains, so the complaints began. Quality of gas was poor as the company did not invest in enough new and improved plant, and 25% of the gas was lost through leakage. Birmingham gas was much cheaper, and in 1877, just after Birmingham Corporation had taken over the Birmingham gas companies, a pipe was laid to Sutton to supply some of the residents with Birmingham gas. The Sutton gas company struggled on until 1892, when Sutton had to choose between meeting the high cost of modernising the gasworks and extending the network, or being supplied by Birmingham. Asked whether they wanted to keep their independence and have a Sutton gas company to be proud of, or be completely dependent on Birmingham, Suttonians swallowed their pride and chose the cheaper option. The gasworks in Riland Road closed down, and lay derelict until the Sutton Corporation built its electricity power station there eight years later. The large gas lamp on top of the “Pepper Pot” illuminated the junction of High Street, Coleshill Street and Mill Street, as this 1880s photograph shows. (The Pepper Pot was a public weighbridge). Sutton Library photograph.